So, I've been on a dark chocolate kick for awhile now. I never really liked the stuff as a kid, but now I can't get enough of "good" dark chocolate. Dark chocolate M&Ms are good, though dark chocolate peanut M&Ms just don't taste right. Quality dark chocolate bites are also good, that includes the little Hershey special dark mini bars. So, I decided to try Hershey's Special Dark Syrup. 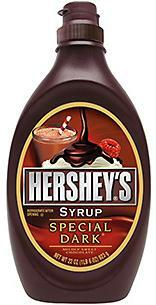 It's a fine syrup, but in general, I think regular chocolate syrup is the way to go. I've added it to several flavors and it just doesn't hit my palette quite right. The one exception is when I added it to Breyer's Double Churn Peanut Butter Fudge. If you add just the right amount, the whole thing tastes like a giant Reese's Peanut Butter Cup. It was fantastic! Hmmm, I'll have to try Breyer's Peanut Butter Cup ice cream again and do a comparison.